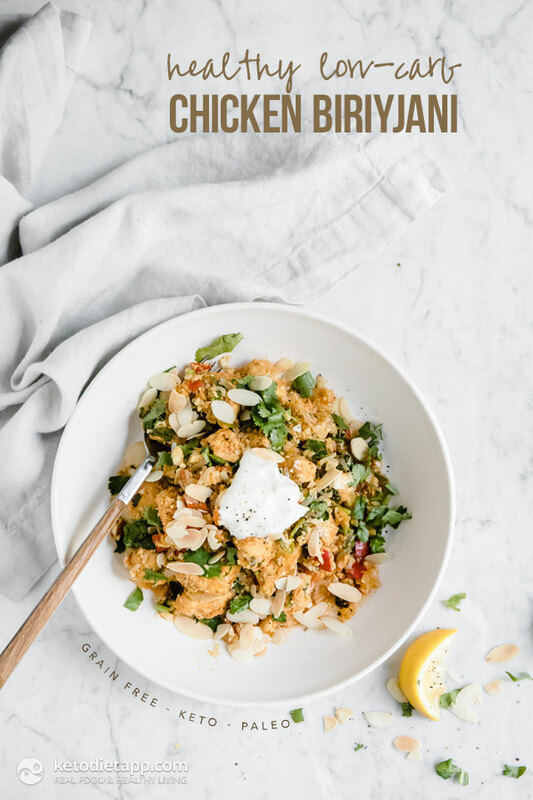 Chicken Biriyani is a popular Indian dish usually made with basmati rice but here at KetoDiet we like to keep the carbs low to keep blood sugar levels stable so I’ve created this keto-friendly Biriyani made from a combination of cauliflower rice and shirataki rice. 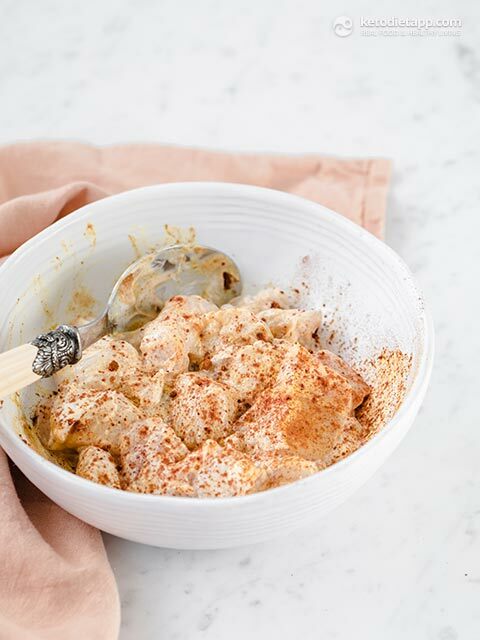 Cauliflower whilst lower in carbs than rice it still contributes to the arb count which is why I chose to use a combination of shirataki and cauliflower. Shirataki rice is made from konjac flour, largely composed of water and glucomannan, a water-soluble dietary fibre, are very low in carbs and calories. Make sure that when you buy your shirataki rice you check the ingredients as some brands contain oat flour. Miracle Noodles are my favourite. 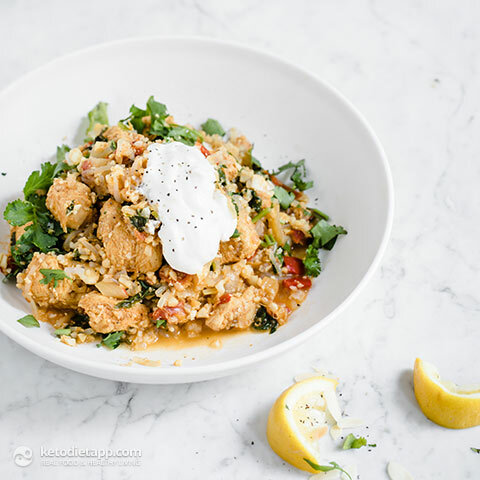 Ready in just 30 minutes, it’s a quick, easy week night dinner recipe the whole family will love. High in protein, it’s a delicious low-carb meal especially if you’ve just finished a training session to help replenish your muscles. This healthy one-pot meal can also be prepared in a slow cooker. Simply follow the recipe until step 5 and then transfer to a slow cooker. Cook on high for 3 hours. Add the cauli-rice and shirataki rice for the last 60 minutes of the cooking process. Heat a non-stick pan on a medium-low heat. Add the cardamom pods and cumin seeds. Dry fry for 15 seconds to release the flavour. Turn up to a medium heat and add the ghee, onion and fry for 3 – 4 minutes until soft and translucent. Add the tomatoes, tomato puree, red pepper, chilli, ginger, garlic, coriander powder and garam masala. Fry for 1 - 2 minutes. Add the chicken and seal for 4 minutes. Add the stock, season with salt and pepper, saffron, bay leaf and cinnamon stick. Simmer on a medium heat for a further 5 minutes. 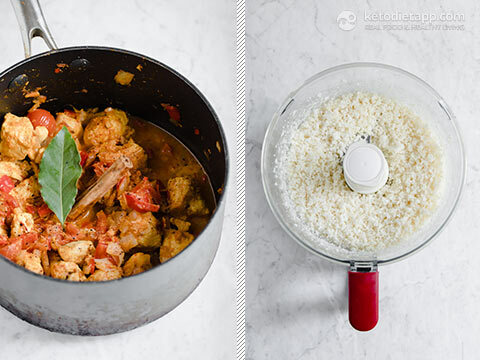 Blitz the cauliflower in a food processor using the S blade until it resembles a rice consistency. 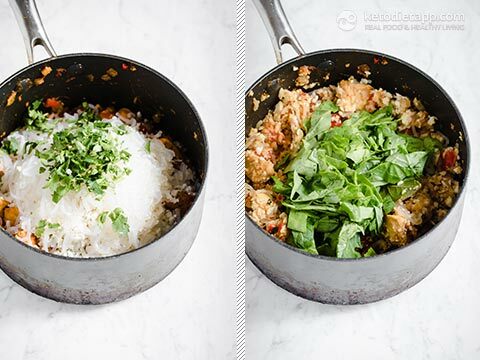 Rinse and drain the shirataki rice (or for best results, prepare according to the instructions here). Stir the cauliflower and shirataki rice through the sauce. 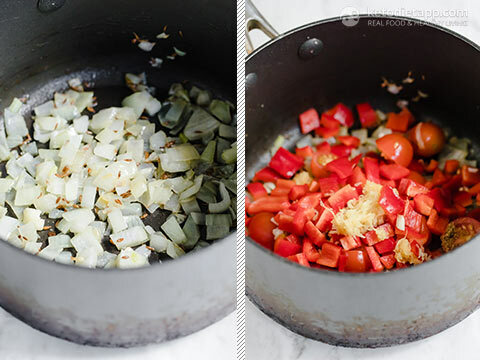 Add the lid and allow to cook for 10 minutes on a medium-low heat until all the moisture has absorbed. If required, option to add a little more stock. Remove the bay leaf and cinnamon stick. 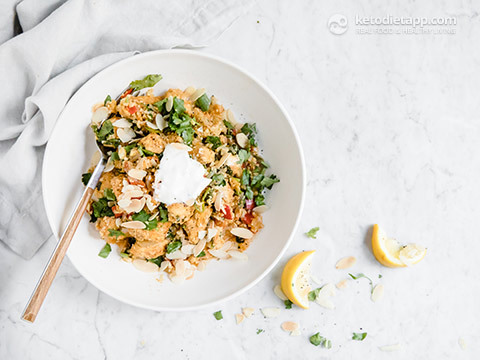 Serve with a squeeze of lemon, chopped coriander and flaked almonds. Optionally, top with sour cream. Best when served fresh, but can be stored in the fridge for 1 day.